There’s plenty of ‘turbulence’ in the world of digital marketing and advertising today, with many of the world’s biggest advertising spenders actively questioning the effectiveness and value of their current digital activities. Many of the concerns that these companies have raised relate to issues like ad fraud, viewability, and inappropriate ad placements. These are all critical issues that our industry needs to address as a matter of priority of course, but they’re not the only causes of disappointing digital ROI, and many of the most common issues are directly within brands’ control. One of the main reasons our digital activities aren’t delivering the results we’d like is that we’re still failing to deliver compelling content. Even when we do create compelling content though, we can waste all that good work by delivering it in the wrong moments or contexts. And lastly, if you’re relying on the wrong metrics to measure your digital activities, there’s a good chance that you’ll be making sub-optimal choices based on those findings. So, how can we overcome these issues, and deliver better bottom-line success? You'll find the answers to this question in our new Forward Thinking video, which shares practical advice on creating content that adds greater value to your brand, as well as how to measure the actual contribution that this content makes to your bottom-line results. You can watch the video guide in full in the YouTube embed below (or click here if that's not working for you), but scroll down to read the full transcript, and find a download link for the slides we use in the video too. Let’s address each of the challenges we outlined above in more detail. The first step towards better digital ROI is to focus on adding audience value at every opportunity. This is the fundamental principle of all marketing: we need to deliver mutual satisfaction of wants, needs and desires. The diagram below neatly sums up that concept of mutual satisfaction: we’re looking for opportunities to deliver the things that our audiences want, at the same time as achieving our own brand and organisational goals. But there are various ways in which brands can deliver that audience value, and we're not restricted to delivering it solely through products and services. The world’s best brands – the ones that marketers love to feature in their case studies, like Nike and Red Bull – use every element of their marketing mix to add this tangible value. In Nike’s case, they’ve become so good at this that people are even willing to pay to be a part of marketing activities like their branded 10K runs. 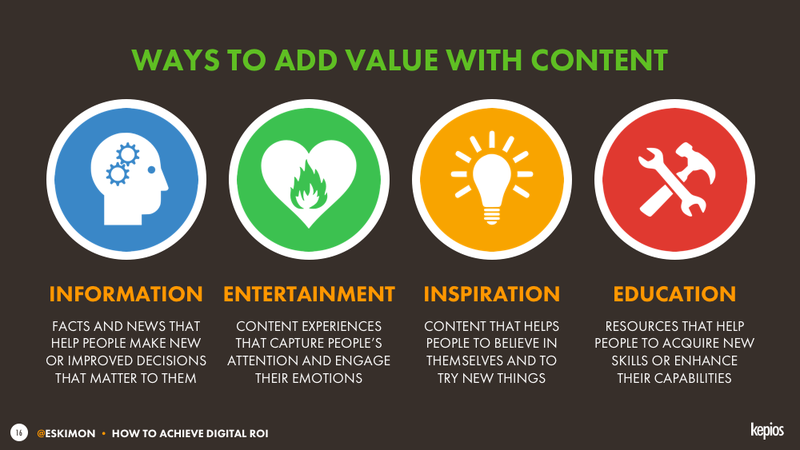 This ‘value added marketing’ approach is particularly applicable to digital activities too. Our advice to is to plan and conceive all content from the perspective of the value that that content will deliver to your audience. What benefit will people get in return for giving you their time and attention? Remember that audiences are looking to maximise their digital ROI too, and they’ve got plenty of other things to do with their time than listen to ego-centric marketing. Information and entertainment already feature heavily in many marketing activities, but it’s easier to drive deeper engagement using inspiration and education. And there’s no reason why this kind of content shouldn’t achieve the same level of audience reach as any other content, either. So, if you’re in the Byron Sharp camp, the good news is that you can still follow his advice whilst creating this kind of content too. The trick is to move from promoting your products and services, to delivering your brand’s value proposition at every opportunity. In other words, use content to make people’s lives better, and not just to interrupt them. However, even great creative will fail if it’s delivered at the wrong moment, or in the wrong context. As a result, engagement planning – or comms planning, if you prefer – needs to evolve from media and channel plans, to plans built around relevant audience contexts and situations. You can then look for vehicles to deliver your activities in the most efficient and effective ways within those moments and contexts. As with so many things in digital, the secret is to start with the people, not the platforms. Having said that though, today’s ad technologies offer many exciting opportunities to engage people. Programmatic may have developed a bit of a bad reputation in the industry – partly because of the issues that we described earlier, such as ad fraud – but most of those issues arise from poor or inappropriate use of programmatic, rather than the technology itself. Used correctly, programmatic tools allow us to serve dynamic content to a specific individual based on their current context and behaviour, which is exactly what marketers need. As a result, there’s no longer any excuse for ‘carpet bombing’ audiences using outdated approaches like demographic target. What’s more, our research has shown that demographic targeting may be actively compromising the success and ROI of digital marketing activities. The chart above is part of some research I did with We Are Social, and it shows male Facebook penetration by age. The red bars represent a comparison between the total number of active Facebook accounts for each given age, and the total global populations for each age (it’s worth noting that we removed China from these results though, because Facebook is still blocked there). Worryingly, this data suggests that there are more 18-year-old males using Facebook than there are 18-year-old males alive in the world today outside of China. Now, obviously those numbers don’t add up. There are many different explanations for this anomaly, and most of them aren’t sinister (click here if you'd like to dig deeper into those), but regardless of the causes, these findings highlight why demographic targeting isn’t the best option. 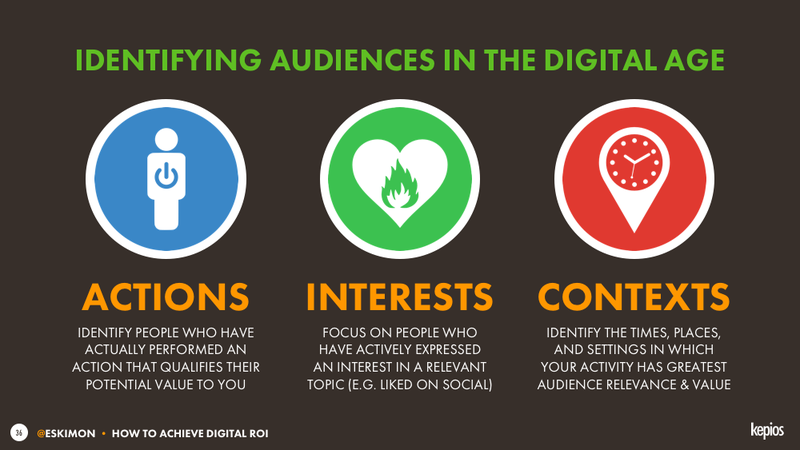 So how should we identify and locate our audiences? Similarly, identifying people based on the interests they’ve expressed overtly – for example, pages or content that they’ve ‘liked’ on social media – will be a far more suitable gauge of a person’s suitability than their age or gender alone. Contexts aren’t quite as powerful as actions or interests, but they’re still more relevant than the arbitrary numbers in demographics. For example, if a person is visiting a beauty website on a Saturday afternoon, they may have quite different needs compared to someone who’s visiting the same site on a Tuesday morning. And whilst we’re on the subject of ‘targeting’, it always strikes me as odd that the words we use in marketing make it sound like we’re planning to attack our audiences. These people aren’t our enemies, so let’s look for some less aggressive language to describe our activities. If we think about ‘serving’ our audiences instead of targeting them, that will be a useful reminder of the fact that we always need to add value, and not just bombard people with yet more marketing crap. The metrics we use to measure our success inevitably impact how our activities evolve over time. There's even a name for this phenomenon: Goodhart's Law. 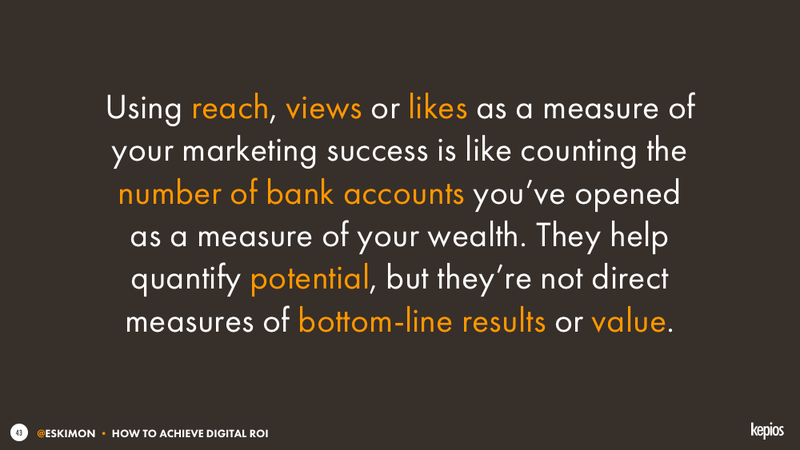 As a result, measuring the wrong things can have a serious, negative impact on ROI. And one of the challenges we face in digital is that almost everything is measurable. The fact that we have to go on training courses just to make sense of Google Analytics – which is just one tool amongst the thousands that we have at our disposal – highlights that we’re drowning in data. However, just because we can count something, it doesn’t mean that that something counts. And when it comes to choosing which metrics to measure, track and report, there’s one question above all others that will help you decide if the it’s going to add value: does it allow you to plan for the future, or does it merely report the past? A rear-view mirror is important, of course, but the forward-looking windscreen is where you should invest most of your focus. Be honest with yourself: does measuring metrics like reach, likes, followers, and views actually help you to improve your bottom-line brand results, or is your organisation simply using these numbers to populate dashboards so that everyone knows how busy the digital team is? Putting too much emphasis on content performance metrics merely encourages you to become more and more like Netflix or HBO, but unless you’re earning revenues directly from your content, that’s unlikely to be the best path to improved brand success. Instead, your marketing metrics need to focus on changes in bottom-line value. Many people seem to think that measuring bottom-line value is incredibly difficult, but we’ve been doing it for a long time with a simple Survey Monkey-like questionnaire that contains only two simple questions. The first question establishes whether a respondent has seen, heard, or interacted with the brand’s digital marketing in any way within a recent survey period (the past month is usually about right). Have you seen any of our social media posts in the past month? Have you opened any emails from us in the past few weeks? Have you visited our website in the past year? The second question should establish the value that the respondent has contributed to the brand within a relevant measurement period. For most brands, this will be the amount of money that the respondent spent on the brand, but if your brand isn’t focused on driving revenues or profits, you should be looking to measure what brand value means for you. How many times have you purchased this brand in the past month? Have you donated to this charity in the past year? Which political party will you be voting for in the upcoming election? Once you’ve collected a representative base of answers – a couple of hundred should be a good start – then you can isolate digital’s contribution to bottom-line value based on your respondents’ answers to the first question. So, in simple terms, you want to compare the average contribution to brand value of people who have been exposed to digital activities, with the average contribution to brand value of those people who have not been exposed to digital activities. The difference in value between these two measures should help you to make some basic inferences on the specific effects and value contribution of your digital activities. This approach isn’t perfect of course, but it’s a lot more robust than relying on content metrics like reach, likes, or views alone. Tracking the difference in value contributions over time will also offer more reliable results, too. And if you’re wondering how to drive responses to your survey, you might want to try something like buying some Facebook adverts which ask people for their opinions, together with a link to your online survey. That will cost a bit of money, of course, but if you’re using your findings correctly, that investment should deliver ROI of its own too. Now, all of that was a bit of a whirlwind through some important and valuable topics, so if you’ve got any remaining question about what today’s tips mean for your brand, or if you’d like to discuss any of the ideas that they’ve inspired, just drop me a note on LinkedIn or Twitter. You can download these slides and reuse them in your own content and presentations too – please just link back to this blog post if you do, and cite Kepios as the source.